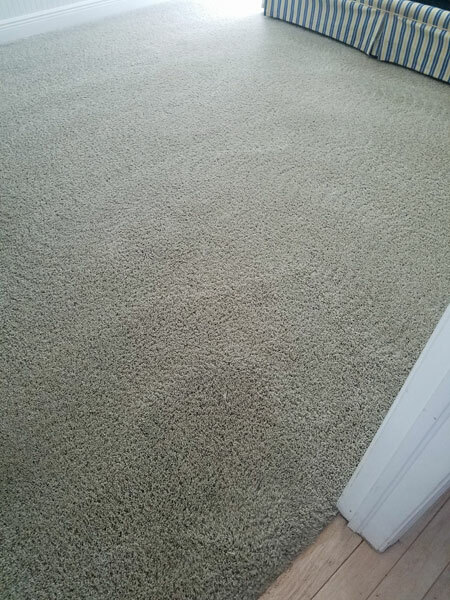 These before and after photos were taken during a carpet cleaning in Tampa FL. The home owner had a small dog that had gotten older and was starting to pee on her carpet. The spots in the carpet are where she had cleaned some stains but the spots just kept coming back. This happens because the urine crystals, sometimes called urine salts, are contain a lot of sugars that easily soiled. If you don't clean them out completely the spots can come back and be worse than they were before. 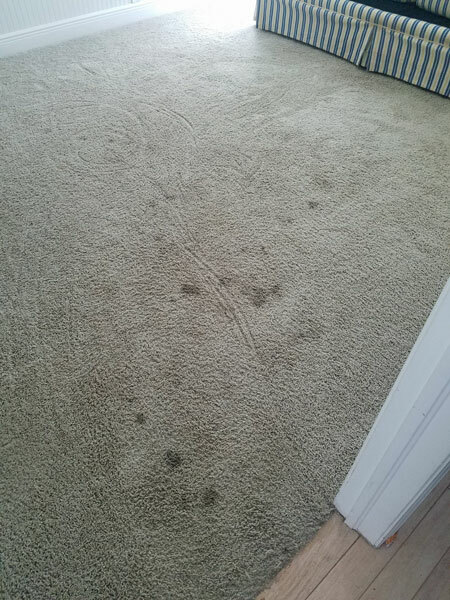 This type of spotting can also be caused by using a carpet spot cleaner that contains a lot of soaps or surfactants. The same problem exists with surfactants, if you don't remove them while cleaning they will attract more dirt. The good news is that Chem-Dry of Tampa FL cleans carpets without soaps or surfactants. Our carpet cleaning solution, The Natural, uses the power of hot carbonation to remove the dirt and other residues out of your carpet. Millions of tiny bubbles scrub the carpet fibers and lift dirt to the surface where it can easily be extracted with our rotational extractor. Carbonation doesn't leave and dirt attracting residues so the spots are gone for good and your carpets stay cleaner longer. There is another added benefit to Chem-Dry's carpet cleaning system. It's completely green certified. No harsh soaps or toxic chemicals are used in the cleaning process. Our cleanings are powerful, long lasting, and safe for your family and pets. If your looking for carpet cleaning in Tampa FL call Chem-Dry of Tampa.